Tourist eyes or old-timer eyes, which are you? Discovery, Uncovery, Recovery –Part of the joy of street or field photography is stumbling onto something that seems significant (treasure by some definition) or at least on the surface (its texture, color, light play or shadow) is worthy to view and possibly record. Perhaps this is something like Serendipity or the kind of things that seemed to happen to Forrest Gump fortuitously again and again. Taken to the extreme, there is mystery and beauty in something as taken for granted as a single breath of clean air or a sip of cool, life-giving water. More often, though, it takes something more obvious to get our attention and trigger the impulse to compose and capture a moment. By contrast, to the person who lives next to a famous photo prompt, perhaps the subject is static background to the plans they make or obligations that give structure to their own discretionary time, intention, and energy. On a larger scale this native versus newcomer phenomenon explains why residents only visit the sight-seeing places when accompanying visitors. To a resident, a particular famous event, site, collection or restaurant is always available and so the long-term resident supposes therefore that by osmosis there is some inherent ownership or relationship they accrue to it. Therefore the need to actually buy a ticket and go inside seems to have very little urgency or necessity about it. There is always tomorrow to do so, it seems. Thinking about this insider-outsider difference from another angle, there are tourists on a 5 day or 3-week timeline who feel each waking moment should be filled with relevant experiences, reading, relaxation and relating to local people, opportunities, occasions, events and so on: they are focusing on inputs, not processing or reflecting or making outputs of their own. Meanwhile that same person returns home to their routines and the cultural infrastructure that makes their life somewhat predictable and stable. Now perhaps the opposite mode is primary; that is, rather than keeping hyper alert and observing the surrounding life and people and language of the place (the input side of things), instead the person navigates through the day and the landscape on autopilot, already thinking several steps ahead to the next obligation or moment when there is a break from responsibility and routine. Now the emphasis is on output: not taking in everything that is playing out in big and small ways around one’s life and in the longer time frames of seasons, years and even decades. The person’s mind and attention is not in the present moment or one lately past. It is on plans for what to do next, what to watch out for, what to fulfill as promised. Jumping now to the metaphor of music performance, the audience member might be dwelling on the sweet sound of a chord or splendid passage of melody as it unfolds in expected intervals or with some unexpected surprising transitions to spice things up. But the well-rehearsed musicians are a few measures ahead, so they know not just the tuning and blending of the present moment as it passes to the one that follows, but they have a wider horizon of view and know the place where the current passage is heading, thus to connect smoothly and with musicianship all the parts between now and that future point, and from that point to the one that follows. In other words, a person with no prior experience of a musical style might be baffled or charmed or mesmerized by the first exposure, but their awareness is very much momentary, since they lack the vocabulary to articulately make sense of the larger production and they don’t know where it is going, nor what it hearkens back to in the wider body of related music. An aficionado will have some of the same depth that a musician has while performing, thus being able to appreciate what goes into the finished experience of all parts interacting. But only the practiced musician has the fullest and richest viewpoint on the piece of music, at least from the notes that guide them in their own part of the whole. With tourists to a strange land and language, too, there are these different levels of proficiency to understand the meanings all around them: the most fluent native will have a wide ranging mind, aware of so many details and able to express the finest gradations of emphasis or distinction. But this high speed ability to navigate the local terrain of meanings comes at the expense of savoring the texture, rhythm and surfaces that the tourist is preoccupied with. Perhaps richest of all is the intermediate position: somewhat able to move across the meanings, but not well enough to master them and dwell at the high altitudes of awareness and preoccupation, nor yet at the beginner level and stumbling over rudimentary aspects of the local society and language. Here in the middle ground there is some awareness of the finite time schedule; that one is not going to be in the current set of circumstances forever and therefore it is worth making the time to do certain things with all due deliberateness and purpose; but not so overly pressed by the time schedule as to make hasty, careless, or ill-considered decisions, big or small. Instead there is a kind of wisdom in using time well (sometimes conserving it; hyper-conscious of its passing, but other times letting go of it, letting the hours freely pass), just as there are wise ways and foolish ways to use whatever money comes into one’s life (sometimes sticking with thriftiness; other occasions being lavish). Buddhists talk about how precious it is to strive to have the mind of a beginner, not weighed down by larger matters, and fascinated in a fresh and uncomplicated way with the surfaces of things. But the thread of these paragraphs, above, argue for the value of something that comes after the beginner’s mind; not the tourist or newcomer to a place absorbed with the inputs, and neither the old-timer who no longer sees the wonder and novelty all around. Instead there is great merit in the middle ground of someone beyond the surface level and not yet fully rooted to a place and oriented to action, accomplishment, and similar outputs. The person at the middle ground can still be amazed by little details, can still set aside high quality time and full attention for local inputs (a camera can frame the seeing process and force some decisions and deliberately slow-down the capture process, simultaneously serving as a trail of breadcrumbs or record of the forays in the local surroundings). But the person at the middle ground can also do some of the things the long time resident can do – make plans, dream dreams, dive into possible futures and dwell on the interior life; in short, the middle ground person can have both input mode of consciousness like a beginner or temporary visitor, and also output mode of consciousness like a long-time resident who has some institutional memory of a place and how it got to be like this now. Yes, there is indeed delight in discovering or uncovering or recovering something that is precious for a fleeting moment or for an eternity. But there is also pleasure in seeing past the surfaces to observe the longer cycles and flow of events before one’s existence and after one has gone. The vision of the momentary and fleeting, intensified by the sense of transient life, as well as the vision of things much bigger and longer lasting than one’s self make the walk-around with camera in hand a worthy pursuit. Categories: heartware, social observation, transience, Uncategorized | Tags: beginner's mind, beginner’s mind, buddhist, camera, discovery, epiphany, forrest gump, local knowledge, outsider, photo walk, serendipity, surprise, tourist, walk around | Permalink. Setting off with camera in hand and only a general circuit or destination in mind, and without fixed time limits, my eye fixes on wondrous light falling on the scenes that present themselves in the landscape or streetscape; or maybe I am drawn to the signs of time passing (poetic intimations of mortality) and people’s efforts purposing some kind of significance or response to the call of responsibility – the features of the cultural landscape. 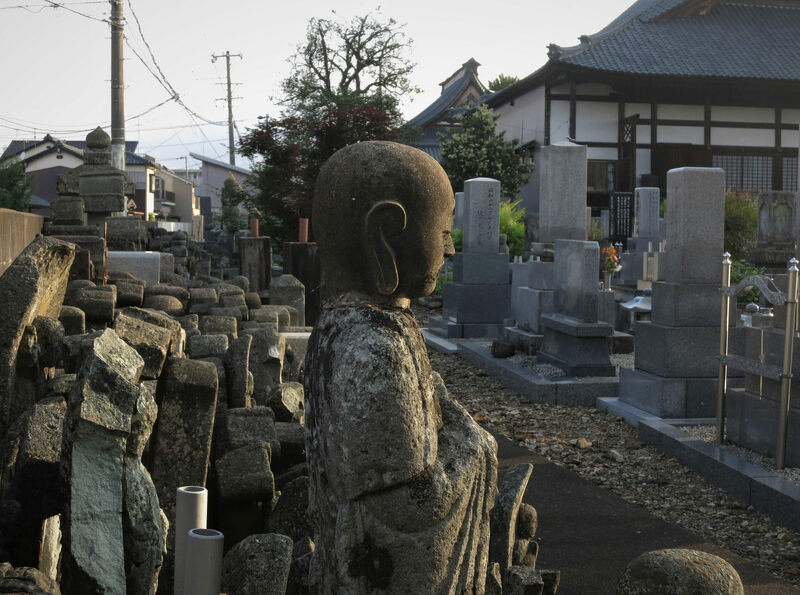 Traces of the past seem relatively infrequent in Japan, where businesses and residences are meant to serve an active span of years and then are either left to dereliction or razed for a fresh generation to make its own mark on the same ground. So there is a small thrill of discovery when a relic of the earlier society and worldview comes into view. By passing along narrow lanes, or the premodern roads not built in ruler-straight lines there is a faint smell of earlier times to discover, particularly in the twilight that comes before and after full light of day. A similar thrill of discovery comes from seeing the plants and animals doing what they do in each season, mostly without reference to the lives of humans that clutter up the space and time occupied by these creatures. For example, seeing small birds gathering materials for nest building, or seeing the big water-wading birds settling onto their large tree-top nests is worth stopping to admire. Watching for flowers about to bloom, animals following their life cycle, and by looking out for traces of the past all draw one’s attention away from the ordinary haste of the all-surrounding consumer worldview of purchase, consume, discard with kudos for finding lowest per unit price or bulk buying. The other vision that takes one outside the normal routines and habits is to view the passing scenes on the day’s circuit with the eye of a cultural detective, reading the cultural landscape to see what recently (or long ago) occurred in a place, whether it is tending a garden or field, pruning the woodlot along a mountain side, or tidying graves during the equinox holiday. All of these ways of seeing and reading the surrounding locations come about by setting a course outside one’s usual route, taken to be the most expedient in the working framework of one’s weeks and years. Rather than having a deadline, time schedule, and destination at some distance from the starting point, let the wandering of the “boulevardier” or “flaneur” be the standard to follow; let the passing scenes themselves be a sort-of cinematic feast of circumstances that move from one view to the next. Let the excursion itself be the purpose or destination; not to arrive at a fixed location, other than to return to one’s beginning place. That way the delight of the moment, the thrill of discovery, and the satisfaction of adding more and more puzzle pieces to one’s map of the wider area being explored can be fully enjoyed as a kind of psychological “flow,” immersing one in the mode of play rather than work; enjoyable for its own sake, not something to be dispensed with in order to reach some other destination. Taking along a camera or two helps to make a trail of breadcrumbs so that one can retrace the steps later with still another kind of vision, the seeing of hindsight. 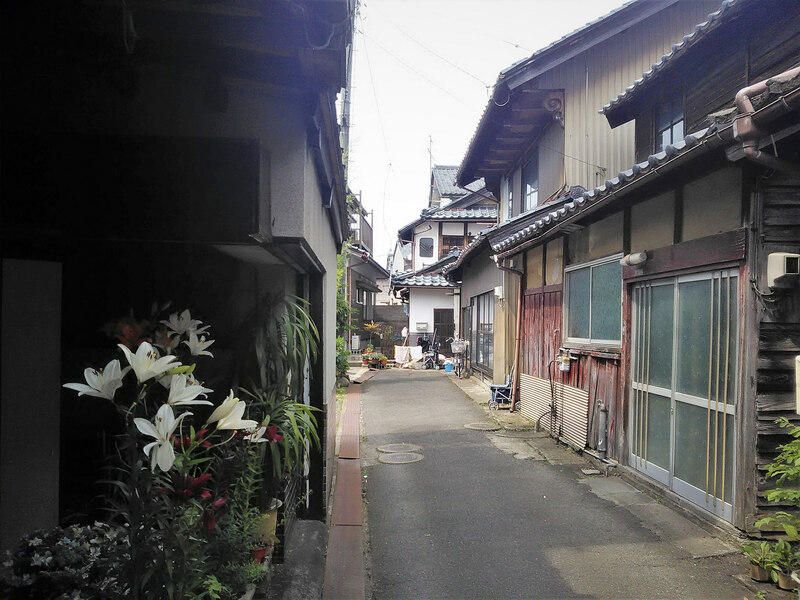 Categories: heartware, reading the light, social observation, transience, Uncategorized | Tags: bike ride, consumerism, cultural landscape, flaneur, flow, historicity, Japan, passage of time, physis, stroll, wander | Permalink. On a fine sunny Saturday, with the early March air still cold enough for gloves and hat, but by noon no longer needed, I pedaled along with camera in pocket on the lookout for light or locations of interest as single shots or to be stitched into something more immersive*. Part of the route around the skirt of the mountain (about 10-12 km in circumference) was familiar from 30 years ago when first living and working in this valley, and then returning at intervals of 5-6 years thereafter. But usually those memories were just passing by, almost always by car or bus. So to take some of the narrow lanes and the walkway along the river by bike was a new experience. Thinking about how those earlier memories differed to this pleasant Saturday morning, it seems that the main difference is middle-age. Much of the life work of establishing oneself and one’s family, the circle of births and deaths, job changes, moving, and so on already is done or at least is very much less of a preoccupation. As a result, if the decades of one’s 20s and 30s was like a 55mm or 80mm lens (using the film reference to a 35mm camera), a series of moments, often discrete and disconnected, then now there is less need to prove, to achieve, to accumulate. So it is enough to “be” rather than to “do.” I can quietly roll along the paved surfaces reflecting on the lives underway around me, or the signs of better days at the sites of relic buildings, agriculture worksites, and so on, “reading” the landscape and social space around me. Perhaps the set of constraints, expectations, and bills to pay made the idea of setting off without a definite route or destination or time frame in mind unimaginable in those earlier life decades. Whatever the reason for not doing something so enjoyable as today’s excursion, at least I am glad now for the ride and photos along the way on this occasion; and I truly look forward to many more times like it. Having a wide-angle lens experience of life is satisfying, since the many moving parts can be seen all together, the context and the arc of developments all add meaning and let one’s own presence fit into the whole, as well. It makes sense that one’s 20s-30s-40s are lived in a narrow angle of view rather than the wide-angle that I speak of. But even so, I am pleased with the wide view of today! 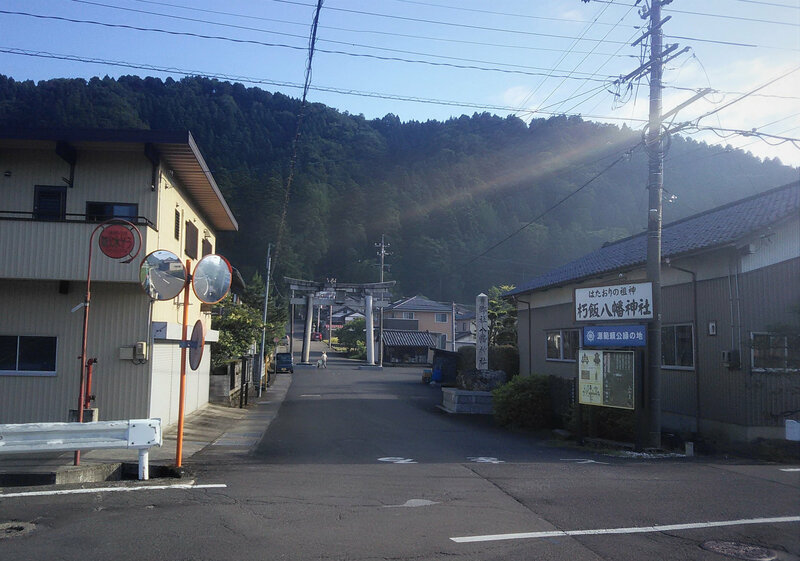 Categories: heartware, transience, Uncategorized | Tags: bicycle, fukui-ken, imadate, middle-age, panorama, stage of life, wide-angle | Permalink.